PaperDinosaurs Linda Hall Library An Exhibition of Original Publications from the Collections of the Linda Hall Library. 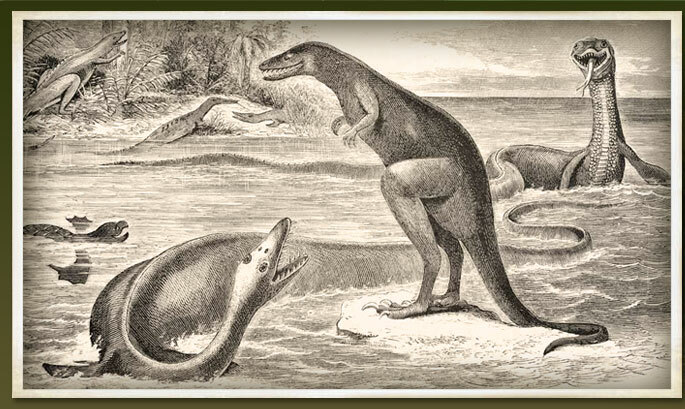 Paper Dinosaurs is an exhibition of original printed materials related to the history of dinosaur discovery. The online exhibit was completely redesigned in 2009. The exhibition was then transferred to a virtual format on the web and expanded to include thirty-five additional works that could not be accommodated in the original exhibition space. It then ran relatively unchanged until 2009, when the pages were redesigned and the images reshot. Paper Dinosaurs now includes 94 images images, with each image available in a small or large format. Clicking on any small image will bring up the large version, and vice versa. The original exhibition was accompanied by a printed catalog, which is still available from the Library. The printed catalog does not include the 32 supplemental works that were added for the online exhibition. Click here if you would like to order the catalog. We hope you enjoy Paper Dinosaurs. Please continue to the exhibition.